Linseed Oil. We didn’t try this based on reading this: It seems to be a very slow drying oil, can stay sticky or doesn’t dry at all. This can happen if linseed oil is applied too thickly, onto damp materials, or when temperature is too cold. Also, Linseed Oil is not completely denatured, so it can encourage rather than discourage mildew growth. Linseed Oil does not harden sufficiently to offer enough resistance to abrasion. It has been used for interior wood floors, but it must be waxed for durability. Olive Oil. Floors look great if no one walks on it; quickly looks bad after people and dogs start using the floor after application. Do not recommend! From Pure & Easy Cleaning website: Olive oil or other food oils: Certainly these are non-toxic but they shouldn’t be used for cleaning. They do not have any chemical properties that remove dirt or bacteria. Instead they can turn rancid, which is definitely unclean. Most wood furniture manufacturers and antique dealers do not recommend oiling wood. Wood does not soak up oil. It makes the wood look shiny for a time, but only until it evaporates. Prior to evaporation, the oil just attracts and holds dust. After the oil evaporates, the residue it leaves behind eventually leads to a dulling build-up. If your wood is “dry” or routinely gets wet (like a wooden salad bowl), use pure mineral oil. Though a petroleum-derived product, it is the only non-toxic and safe oil for wood. 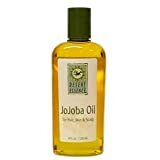 Jojoba Oil doesn’t look so great after people and dogs walk on it, but we may continue to use it since the floors look better nourished and it’s better than other natural options that we’ve tried so far.